My maternal grandmother makes this special spice mixture. It was passed on to her by her mother, which was in turn passed down by her mother. Now, I’m glad to be the recipient of this recipe. This mixture of spices is the secret that lends a unique and exotic taste to my grandmother’s cooking. It goes into the making of many of her dishes, both simple day to day cooking as well as food made for festive occasions. Her spicy, tangy and lip smacking eggplant/brinjal vegetable, huli (a soup like stew of vegetables mixed and eaten with rice), juicy potato vegetable (aloo ras bhaji), spicy and tangy eggplant rice (vangi bhath) and many other myriad dishes from her kitchen contain this special mixture of spices. During the time when my grandfather was alive, my grandmother’s table was open to all for breakfast, lunch and dinner. Relatives, friends and acquaintances always made an appearance during meal times to savour the lip-smacking goodies that she made and my grandparents never ever ate alone. My grandmother is an amazing cook and at her age of 77, she stuns me with her interest and enthusiasm in cooking. Whenever she came to visit us when we were kids, this spice mixture was the first thing she made. I’m sure she did the same when she went to visit my aunt. Grandmothers are such special people who touch our lives with genuine love and mine has fed me delicious food, taught me and answered my doubts. I feel blessed to have her in my life. This spice mixture can be used to spice up vegetable, rice and dal preparations. The recipes using this spice mixture will be uploaded on divinetaste gradually. 1 ½ tsp oil approximately. In a medium sized wok or kadhai, dry roast the sesame seeds and the coconut separately. Heat the oil and gradually roast all the other spices individually until they become aromatic. Take care not blacken or burn the spices. You can add a little oil in between if the wok or kadhai runs dry. 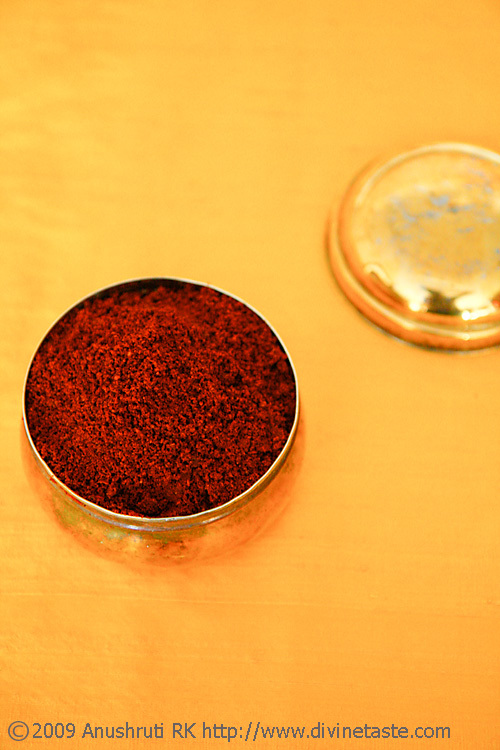 If using turmeric root, roast it in oil but if using turmeric powder just mix it in after all the spices are roasted. 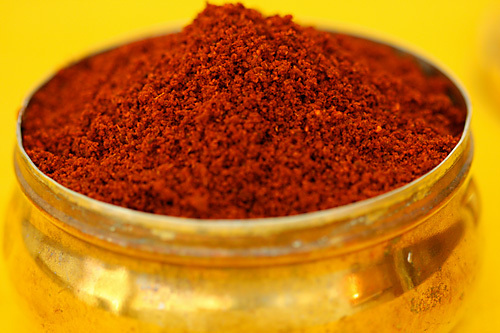 Allow the spices to cool and with the help of a mixer/grinder/food processor powder fine. And on two occasions Rohitanna and you, for two months long,got her to stay with you in Mumbai. Lucky you! Now she cant do those travels, damn! And like always… Splendid pictures! I as Grandmother thrilled with such fine documentation of my age old receipe and to find you mentioning specially about me and my cooking, I am elated with some emotional feeling within. God bless you and my blessings are always with you. I sincerely hope such secret recipes are shared with evryone interested and passed it down the generation. Wow..this is a special post i must say.. with ur ajji's response making it more special.. i would love to try this.. please let me know if its white sesame seeds? the best pics in the website!! the container makes it look so so earthy and unique.. i'm sure its ur ajji's brass container too…right? Soumya: Thanks. I'm happy you enjoyed this post. This recipe uses white sesame seeds. It is Anu,Aravindmama`s daughter. Hearty congratulations on being mother. Yesterday Rekha aunty, told about your website. We met at Akshay`s marriage at Dharwad. Really it was great to know about your success. I was also glad to undergo the recipes you heve mentioned. I will definitel try these dushes. Thank you for such a beautiful and informative site. Your photos are gorgeous. Keep up the good work. I would love to try this recipe…. I will try it and update the results…. And I am lucky too to have a wonderful and beautiful grand mom like u do…. Ashwini: How sweet of you to notice that! yes…grandmothers are like fairies on earth! Yes Byadgi mensinkayi works best here. A very aromatic and flavorful powder.Also a very happy independence day to you and your family. I follow your blog quite regularly & have tried out many recipes about Spices in India are rally so good. Thank you so much for this goda masala recipe. I have been looking for one for a long time. I can't wait to try it out.